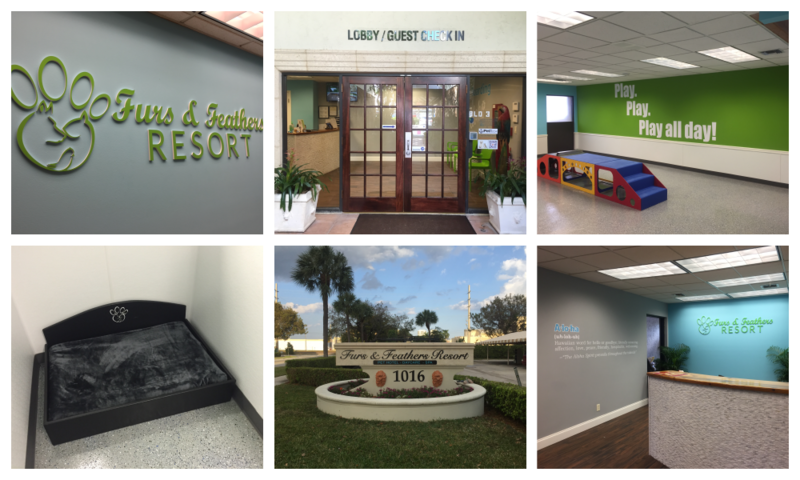 Furs & Feathers Resort is a hotel, daycare and spa for pets, newly opened in West Palm Beach. It’s a more then average boarding facility. All pets are welcomed the aloha way! Sign Partners was approached by the owners for all signage needs, both indoor and outdoor to welcome all pets and their owners. The project started with the request for an exterior monument sign. The property had an existing structure and needed to be customized for Furs & Feathers Resort. The main objective was to incorporate the branding and help with wayfinding. The interior signage needs were mainly focused on decoration but with an informative aspect. The lobby is enhanced with a custom dimensional lobby sign of the logo together with some digitally printed wall graphics to emphasize on the Hawaiian theme. Furthermore Sign Partners designed entrance signs indicating the lobby / guest check-in and the cat lounge & bird sanctuary. A fun aspect of this project were the custom decals which were especially made for the dog beds in the hotel. We used sign partners for a variety of signage needed for our business. Matheus and Mirel are very professional and personable. They understand attention to detail and provide quality work. I highly recommend working with them for all your signage needs.